Get ready for that amazing, powerful mid-punch! I've always been fascinated by Alexi's tone - so simple yet powerful and punchy. After trying to mimic it for many years there has always been something missing. So finally I decided to give this pickup a try. It got installed into an Ibanez RG350DXZ and boy did it sound good!!! Not only it sounds amazing, but it feels that way too - juicy and powerful, yet articulate. As for the million dollar question - how 'Alexi' is the tone - I can safely say it is EXTREMELY 'Alexi'. I've been able to nail the tone of each of COB's albums. Thanks to the internal preamp, the guitar is now screaming when an artificial harmonic is played. Build quality is outstanding. Installation is quite easy really and you've got everything you need in the kit. The only thing I find inconvenient about it is the preamp gain control is hard to reach when installed on a front-routed guitar. So make sure to set it up to your liking BEFORE closing the guitar. Great sounding pickup, definitely delivers that Alexi sound and feel. I doubt there's a better one to get you there. EMG ALX - Successful update! General: The new EMG ALX comes in a very attractive new packaging with a beautiful appearance, which greatly increases the anticipation. The sweatband as gimmick is top for the Laiho / COB fanguys. 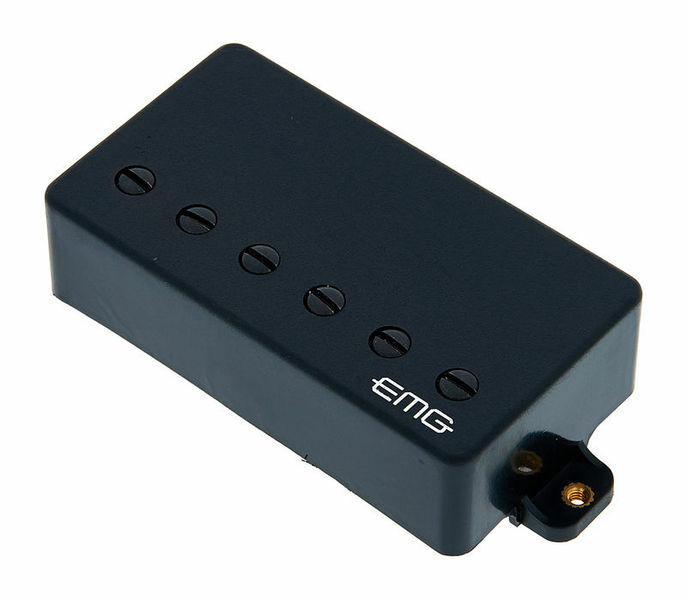 I myself have used the EMG HZ with MM-04 Booster in one of my ESP Customs and have thus a direct comparison to the predecessor! Installation: Basically, the Einabu is SOLDER-FREE. So everything just plug connections. Unfortunately, this does not pay for guitars such as ESP SVs / ALs / RLs, as the jack sockets are located in the upper wing and the EMG gelled cables are too short. That is: soldering. Sound: The old setup HZ + MM-04 was originally not designed, because the Musamaailma-made boost was designed for the old Jacksonton pickup. The ABQ is basically the same as the MM-04 (Instead of the small switch is now switched with the potentiometer). The fact that ABQ and ALX have been designed for each other makes the center lift much more noticeable compared to its predecessor. Conclusion: Very successful update to the previous model. ID: 226192 © 1996–2019 Thomann GmbH Thomann loves you, because you rock!